Poale Zion (also spelled Poalei Tziyon or Poaley Syjon, meaning "Workers of Zion") was a movement of Marxist–Zionist Jewish workers founded in various cities of Poland, Europe and the Russian Empire in about the turn of the 20th century after the Bund rejected Zionism in 1901. Poale Zion parties and organisations were started across the Jewish diaspora in the early 20th century. A branch of Poale Zion came into existence in New York City in 1903. Branches were formed in London and Leeds in 1903/04 and 1905 respectively and on a national basis in 1906. An Austrian group was formed in 1904, and published a newspaper, Yidisher Arbeyter. In November 1905 the Poale Zion (Workers of Zion) Party was founded in Palestine and a month later the Socialist Jewish Labour Party (Poale Zion) was formed in the United States and Canada. In March 1906 the Jewish Social Democratic Labour Party (Poale Zion) was created in Russia. In 1906 a formal Poale Zion party was formed in Poltava, Ukraine, under the leadership of Ber Borochov and Itzhak Ben-Zvi, and other groups were soon formed elsewhere in Europe. A French group was formed, under the leadership of Marc Jarblum, which was influential on the SFIO and its leader Leon Blum. The key features of the ideology of early Poale Zion were acceptance of the Marxist view of history with the addition of the role of nationalism, which Borochov believed could not be ignored as a factor in historical development. A Jewish proletariat would come into being in the land of Israel, according to Poale Zion, and would then take part in the class struggle. These views were set out in Borochov's Our Platform, published in 1906. A World Union of Poale Zion was formed. The first World Congress took place in August 1907 in The Hague. Its second congress in 1909 in Kraków emphasised practical socialist projects in Palestine, further congresses followed in Vienna (1911 and 1920) and Stockholm (1919). In Ottoman Palestine, Poale Zion founded the Hashomer guard organization that guarded settlements of the Yishuv, and took up the ideology of "conquest of labor" (Kibbush Ha'avoda) and Avoda Ivrit ("Hebrew labor"). 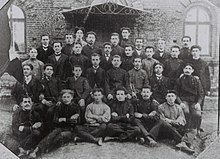 The first formal congress of "The Jewish Social Democratic Workers party in the Land of Israel- Poalei Tziyon" was held in early 1907. Poale Zion set up employment offices, kitchens and health services for members. These eventually evolved into the institutions of labor Zionism in Israel. By 1907, the party had 25,000 members in Russia. During World War I, Poale Zion was instrumental in recruiting members to the Jewish Legion. Poale Zion was active in Britain during the war, under the leadership of J Pomeranz and Morris Meyer, and influential on the British labour movement, including on the drafting (by Sidney Webb and Arthur Henderson) of the Labour Party’s War Aims Memorandum, recognising the 'right of return' of Jews to Palestine, a document which preceded the Balfour Declaration by three months. Poale Zion in Britain formally affiliated to the British Labour Party in 1920. The American party was led by veteran socialist Zionist thinker Nachman Syrkin. Whilst the Bund was forcibly disbanded in 1921, Poale Zion and Hechalutz were allowed to operate freely in the Soviet Union until 1928. Poale Zion was torn between Left and Right factions in 1919-1920, which formally split at the Poale Zion fifth world congress in Vienna in 1920, following a similar division that occurred in the Second International. The right wing was less Marxist and more nationalist, and favoured a more moderate socialist program and supported the International Working Union of Socialist Parties to continue the work of the Second International, essentially becoming a social democratic party. The left wing faction did not consider the Second International radical enough and some accused its members of betraying Borochov's revolutionary principles (although Borochov had begun to modify his ideology as early as 1914, and publicly identified as a social democrat the year before his death). Poale Zion Left, which supported the Bolshevik revolution, continued to be sympathetic to Marxism and Communism, and attended the second and third congresses of the Communist International in a consultative capacity. They lobbied for membership, but their attempts were unsuccessful, as the internationalist communist movement under Lenin and Trotsky was opposed to Zionist nationalism. The Comintern advised individual members of Left Poale Zion to join their national Communist parties as individuals; at their 1922 Danzig conference, these terms were rejected by the party and the Comintern declared it an enemy of the workers' movement. Poale Zion Left opposed the decision by Poale Zion to rejoin the World Zionist Organization, viewing it as essentially bourgeois in character, and viewed the Histadrut as reformist and non-socialist. Aside from differing attitudes towards Zionism and Stalinism, the two wings of Poale Zion parted ways over Yiddish and Yiddish culture. The Left was more supportive of the latter, similar to the members of the Jewish Bund, while the Right bloc identified strongly with the emerging modern Hebrew movement in the early 20th century. In Palestine, the major leaders of Poale Zion since their immigration in 1906 and 1907 had been David Ben-Gurion, who joined a local Poalei Tziyon group in 1904 as a student at the University of Warsaw, and Yitzhak Ben-Zvi, a close friend of Borochov's and early member of the Poltava group. After the split the two Benim ("the Bens") continued to control and direct Poale Zion Right in Palestine. The party in Palestine split into right and left wings at its February 1919 conference. In October 1919, a faction of the Left Poale Zion founded Mifleget Poalim Sozialistiim (Socialist Workers Party) which became the Jewish Communist Party in 1921, split in 1922 over the Zionist issues, with one faction taking the name Palestine Communist Party and the more anti-Zionist faction becoming the Communist Party of Palestine. The former retained its links to Poale Zion left. These two factions reunited as the Palestine Communist Party in 1923 and become an official section of the Communist International. Another faction of Poale Zion Left, aligned with the kibbutz movement Hashomer Hatzair, founded in Europe in 1919, became the Mapam party. Poale Zion Right, under Ben Gurion's leadership, formed Ahdut HaAvoda in March 1919. In January 1930 it merged with another party to become Mapai, predecessor of the modern Israeli Labor Party. In Russia, the Poale Zion Left participated in the Bolshevik Revolution and organized a brigade of Poale Zion activists  nicknamed the "Borochov Brigade" to fight in the Red Army. The party remained legal until 1928 when it was liquidated by the NKVD. Most other Zionist organizations had been closed down in 1919, but Poale Zion Left remained untouched because it was recognized as a Communist party. In 1919, the Communists of Poale Zion Left split to form the Jewish Communist Party which ultimately joined the Communist Party of the Soviet Union, leading to a sharp loss of membership in Russia. In Poland, for a brief period following the war, both factions of Poale Zion were reported as legal and functioning political parties. The Polish Left party was the largest Left Poale Zion party in the world. It worked closely with the Bund in developing Yiddish schools in Poland and supporting secular Yiddish culture, although they had political differences (e.g. the Bund was more supportive of the Polish Socialist Party than LPZ). As part of the large-scale ban on Jewish political parties in post-war Poland by the Communist leadership, both Poale Zion groups were disbanded in February 1950. In Austria, the left faction was led by Michael Kohn-Eber, who joined the Austrian Communist Party in 1938. The right faction also remained active until 1938. In America, the right faction was dominant, and initiated the National Labor Committee for Palestine, raising money for Histadrut. Globally, Poale Zion, under the leadership of Shlomo Kaplansky was involved in the 1921 formation of the centrist International Working Union of Socialist Parties, then between 1923 and 1930 the World Union of Poalei Zion (i.e. the PZ right) joined the Labour and Socialist International (as its Palestine section). As of 1928, it claimed to have 22,500 members in branches around the world; 5,000 in Poland and the United States, 4,000 in Palestine, 3,000 in Russia, 1,000 in Lithuania, Romania, Argentina and the United Kingdom, 500 in Latvia and another 1,000 scattered across countries such as Germany, Austria, Czechoslovakia, Belgium, France and Brazil. The general secretary of the World Union of Poalei Zion at the time was Berl Locker. The World Union had a women's wing, the Women's Organization for the Pioneer Women in Palestine. In 1932, Poale Zion's world federation merged with Hitahdut Olamit, the World Union of Hapoel Hatzair and Zeirei Zion (which had been formed in 1920), to create Ihud Olami, the World Union of Zionists-Socialists. In this period, several well-known Zionist leaders and politicians were active in Poale Zion, including Ben-Gurion, Ben-Zvi, kibbutz movement leader Yitzhak Tabenkin, Jewish Agency Executive member Shlomo Kaplansky, and future Israeli politicians Moshe Sharett and Dov Hoz. The Holocaust-era Jewish resistance group ŻOB was formed from a coalition including Hashomer Hatzair, Dror, Bnei Akiva, the Jewish Bund, various Jewish Communist groups, and both factions of Poale Zion. Poale Zion was also active in the Anti-Fascist Bloc. After World War I, David Ben-Gurion integrated most of Poale Zion Right in Palestine into his Ahdut HaAvoda party, which became Mapai by the 1930s. The Poale Zion Left merged with the kibbutz-based Hashomer Hatzair Workers Party of Palestine and the urban-based Socialist League of Palestine to form Mapam in 1948, which in the 1990s merged with two smaller parties, Ratz and Shinui, to form Meretz. In 1946, a split in Mapai led to the creation of another small party, Ahdut HaAvoda - Zion Workers, which united with Mapam in 1948. In 1954, a small group of Mapam dissidents left the party, again assuming the Ahdut HaAvoda - Zion Workers name. That party eventually became part of the Alignment in a 1965 merger with Mapai (and later included Rafi and Mapam). In 1992, the Alignment became the Israeli Labour Party. Several youth movements have emerged out of Poale Zion: the Marxist Hashomer Hatzair (the largest, with 70,000 members on the eve of the Holocaust), the socialist Habonim Dror, the Left Poale Zion's Yugent, and Zeire Zion. In North America, Poale Zion founded the HeHalutz movement, the Farband and Habonim Dror, and later the Labor Zionist Organization of America, which merged with other groups into the Labor Zionist Alliance, which rebranded itself in 2007 as Ameinu. US Poale Zion published a Yiddish newspaper, the Yidisher Kempfer, and an English journal, Jewish Frontier, edited by Hayim Greenberg and Marie Syrkin. In Britain, Poale Zion rebranded itself in 2004 as the Jewish Labour Movement. Internationally, the Poale Zion right is represented within the World Zionist Organization by the World Labour Zionist Movement; the group "to the left" of the WLZM within the WZO is Mapam's successor, the World Union of Meretz. Meretz and Mapam are both members of the Socialist International and, since 2013, the Progressive Alliance. ^ "Poalei Tziyon - Zionism and Israel -Encyclopedia / Dictionary/Lexicon of Zionism/Israel/". www.zionism-israel.com. ^ "Poale Zion Collection". www.yivoarchives.org. ^ "Israel". European Forum for Democracy and Solidarity. Archived from the original on 2015-01-15. ^ "Parties & Organisations". Retrieved 2 June 2017. The Ber Borochov Internet Archive at M.I.A. This page was last edited on 1 April 2019, at 14:19 (UTC).